We now have videos available for you to enjoy as well as show to your family and friends. 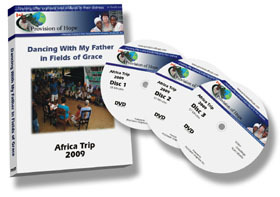 You can request the Africa Trip 2009 video which is a 3-DVD set. Each disc is 1 hour in length and you can obtain them separately or together. DISC 1 – takes a look at the main areas of outreach that Provision of Hope is engaged in within Liberia. DISC 2 – takes a brief look at the areas of Micro Loans, Education Research and Refugee Assistance on the Buduburam Camp in Ghana. DISC 3 – Video greetings from many of the young men who were in My Father’s House and the Discipleship Training Center as well as Barnabas House. As you can well imagine, these were not cheap to produce, package, duplicate or distribute, so whatever you can donate for these videos, it all goes to support the people we serve and is so appreciated! Please expect 2 to 4 weeks delivery time. Thanks for your patience!